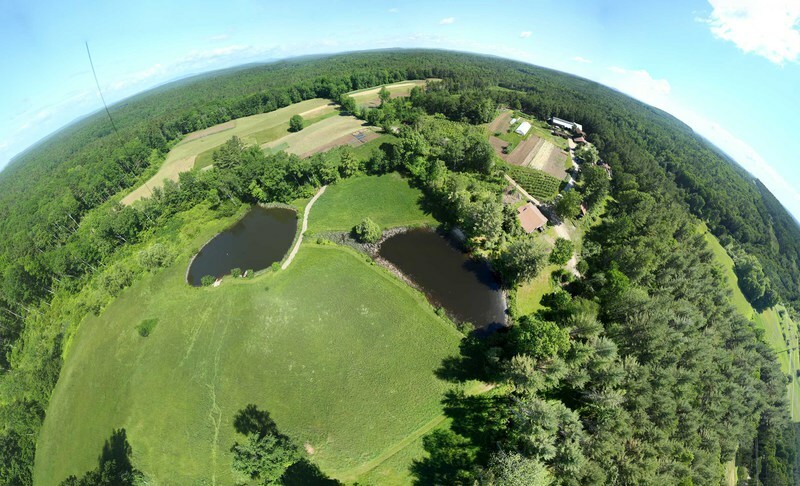 Above: Stereographic projection of a half-spherical panorama stitched from 33 photos taken over Tuckaway Farm in New Hampshire. June 12, 2016. 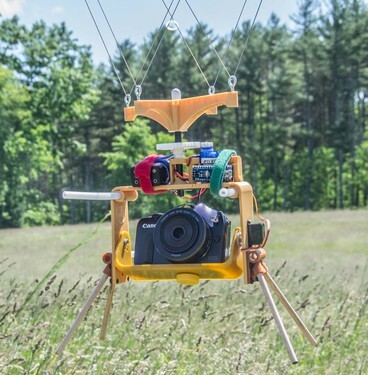 The first flight of my Canon EOS M happened at iFarm in June. I left town soon after and didn't have a chance to process the images, and then summer happened. I did some tests with the EOS M last spring, but the iFarm flight was the first opportunity I had to see if everything worked in the air. The EOS M is the first camera I have flown that is not a PowerShot, and it is heavier, has narrower focal length, has a reputation for a short-lived battery, and cannot be triggered with a pulse to the USB port. That's a lot of variables to make adjustments for, so this was just a test flight, and I didn't expect to get everything right. The EOS M has a large sensor and a crisp prime lens, so the potential for excellent photos was high. All I had to do was program the SkyShield correctly, find all the correct settings on the camera, and make sure the kite would keep the hefty rig aloft. I almost got everything right. Above: The Canon EOS M on a Saturn V Rig at iFarm. The SkyShield autoKAP controller signals the pan and tilt servos to point the rig and flashes an infrared LED in front of the IR remote sensor on the camera to trigger the shutter. The EOS M weighs 165 grams (7 ounces) more than the PowerShot S100 that I have been flying. I noticed immediately that more kite or more wind was needed to keep the hefty rig aloft. With every lull in the wind the rig descended much faster than it usually did under the nine foot Levitation Delta. The Saturn V Rig must stay in about the same place for 130 seconds if the 36 photos taken in each pan/tilt cycle are going to stitch together. With all the rig wandering, I knew that finding a set of 36 photos to stitch together would not be easy. Above: This was one of those uncomfortable north winds that blows the kite right towards the sun so you can barely see the kite or the rig. It turns out that stitching a complete panorama was even harder than I thought. For some unknown reason, the camera was not taking 36 photos in every cycle. Many cycles included 35 or 37 photos. This error needs more study, but the result is that some cycles were missing photos. That makes stitching the complete half-spherical panorama a challenge. I was able to eke out the panorama shown here by including some photos from a different cycle to fill in the gaps. The rig had moved by the time these other photos were taken, so there were some major stitching errors to clean up in Photoshop. 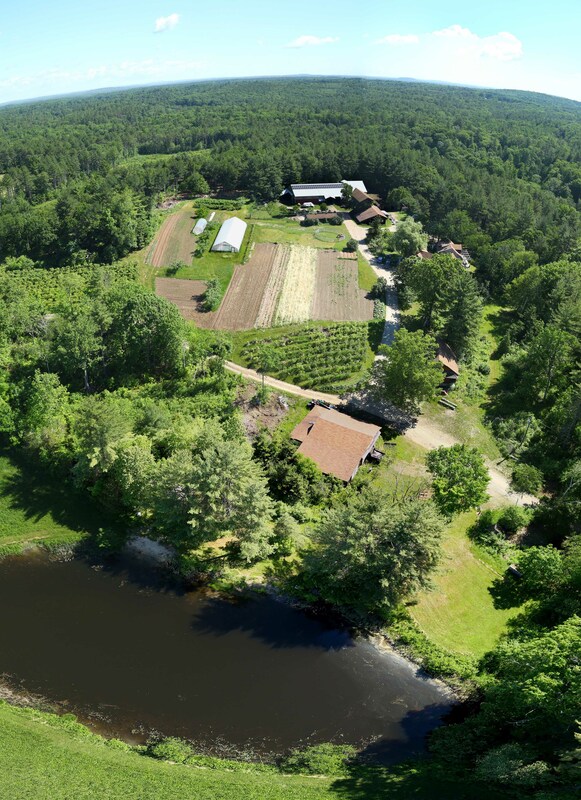 Above: part of the half-spherical panorama of Tuckaway Farm in New Hampshire. We brought down the rig after 30 minutes to check on it and to change the battery in the camera. It turns out that the battery might have lasted another two hours. Last week I put the lithium ion battery in the EOS M to a full endurance test while making a timelapse video of the digital sundial. One battery lasted for three hours and five minutes while the EOS M took 1831 photos, and the next battery lasted for three hours and 14 minutes while the camera took 1946 photos. The photos taken for the timelapse video were not full resolution (they were 4.5 megapixel instead of 18MP), so maybe that takes less battery power. It was also a very hot day and the camera was baking in the sun, and a warm battery will provide maximum power. But it seems that the EOS M battery should be good for a two hour flight in the summer. Above: Parts of five or six photos are included in this portion of the stitched panorama. I am pleased with the quality of the photos. I think they are slightly sharper than photos from the PowerShot S100. Shutter speed was locked at 1/800 second. Instead of using ISO 100 I set the ISO to 200 for this flight which introduced some noise. That allowed the aperture to be near f/4 to f/6 for the ground photos instead of being closer to wide open (f/2). That compromise works much better on the EOS M than on PowerShots because the EOS M sensor performance does not degrade so rapidly with increasing ISO. That was a pretty successful test flight, but I have some work to do before I can expect predictable results from the EOS M. I still have no idea why it didn't take 36 photos during every cycle. Back to the test bench. Hey @dorncox, @cversek, @mstenta, @donblair. 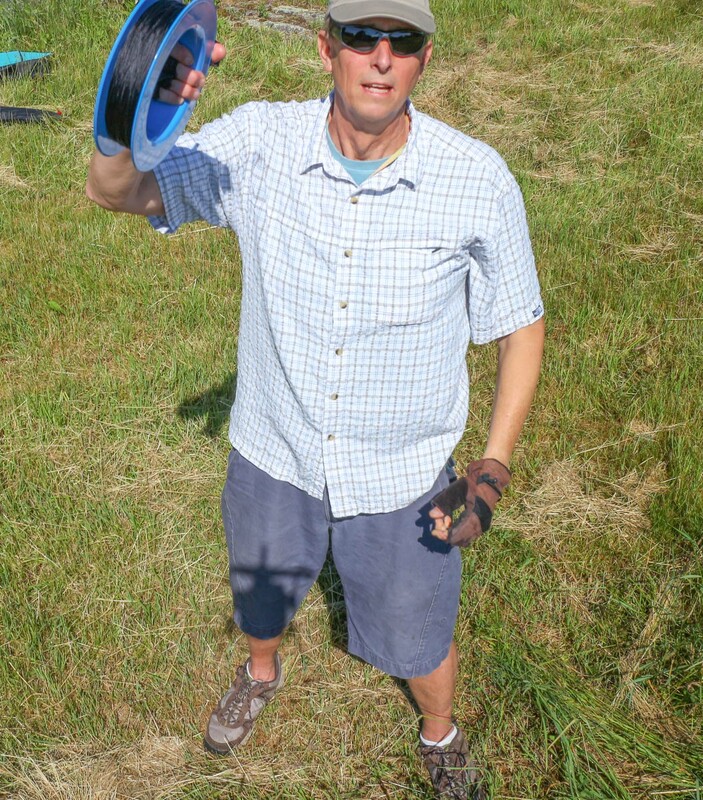 Remember when we flew a kite at iFarm? That was awesome. This is a great research note. I enjoyed reading through all the details.